You are currently browsing the archives for the MNGOP category. According to this article, President Trump will make a campaign appearance in Duluth. Also, “the rally will be at the Duluth Entertainment Convention Center at 6:30 p.m.” Pete Stauber plans on attending the event. Stauber is the GOP-endorsed candidate for the Eighth Congressional District. 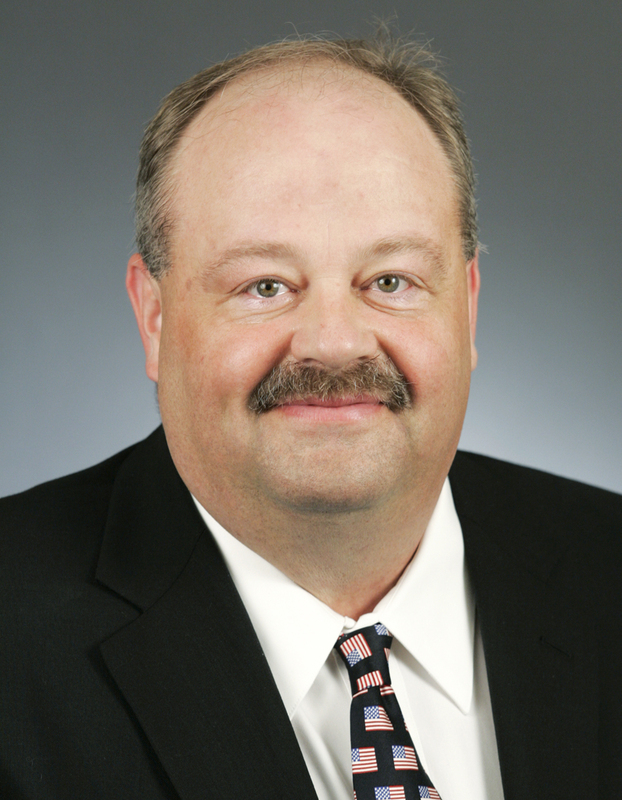 Stauber hopes to replace Rick Nolan. President Trump will increase turnout in the Eighth District. His appearance might help cause voters to switch allegiances. This shouldn’t be seen in a vacuum. Remember that the DFL primaries (gubernatorial and congressional) both pit an environmentalist against a pro-mining candidate. Don’t think that President Trump won’t mention that in his speech. 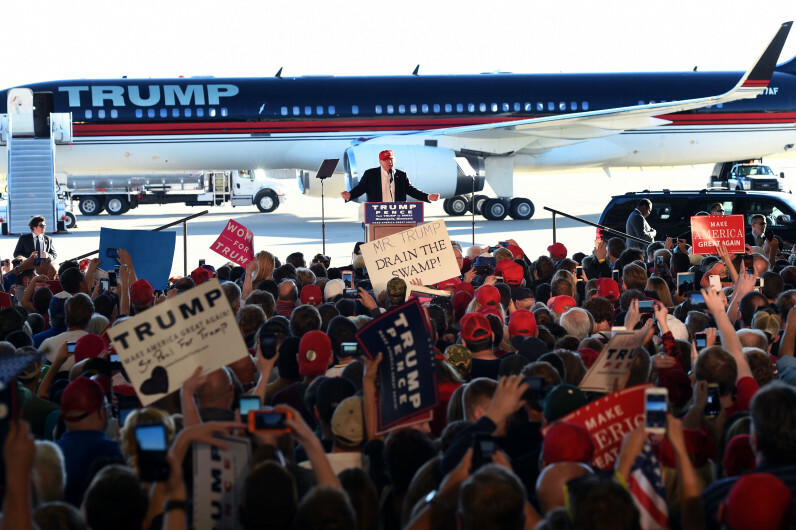 The last time Trump was in Minnesota was right before the 2016 election. Back then, they said stopping in Minnesota and Wisconsin was “campaign malpractice.” I guess the pundits were wrong that time, too. Articles like this one verify something that I’ve suspected since the Supreme Court’s initial ruling in the Legislature’s lawsuit against Gov. Dayton’s line-item veto fiasco. It verifies that these justices are either spineless or they’re politically motivated. That’s a dodge. With all due respect to Chief Justice Gildea, that’s BS. That’s because this doesn’t settle the constitutional issue raised when Gov. Dayton used his line-item veto to cripple the legislative branch. The question that the Court hasn’t addressed is whether Gov. Dayton’s constitutional authority is absolute. Sam Hanson, Gov. Dayton’s attorney, insisted that it is. That’s BS. Frankly, he should have his license suspended for making such a bad faith argument. First, finding out how much money the legislature has isn’t relevant because Gov. Dayton vetoed the legislature’s operating budget for the entire biennium. Next, finding out how much money the legislature has doesn’t determine whether the people have the right to a fully functioning legislative branch. The Supreme Court has essentially ruled that a governor’s authority to control a budget is greater than the people’s right to be represented. 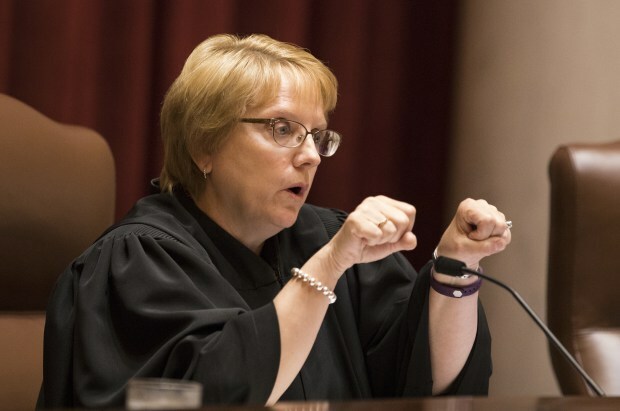 If the Supreme Cowards Court doesn’t rule expeditiously on this aspect of the fight, Minnesotans should consider impeaching these justices for not upholding the Constitution. Any black-robed idiot that thinks a governor’s budgetary authorities are more important than the people’s right to representation needs to be impeached because their thinking is totally screwed up. They’re incapable of thinking things through. Chief Justice Gildea, if you won’t stand up for the people’s right to representation, then you’ll have to go. Ditto with the other justices that voted with you. I’ve written something about the Supreme Court’s unwillingness (thus far) to issue a FINAL RULING on whether a governor’s right to a line-item veto is more important than the people’s right to representation at the state capitol. It’s time to make a final ruling on which constitutional provision is most important. Rep. Brian Daniels’ guest column in the Owatonna newspaper brought lots of good news. Despite the positive things this legislature did, Emperor Dayton still wasn’t satisfied. He’s still insisting that Republicans trim their tax relief package. Here’s hoping that Speaker Daudt and Sen. Gazelka remind Emperor Dayton of the good things that Republicans did for Minnesota families. In the past, Emperor Dayton hasn’t put a high priority on families’ budgets. He’s put his highest priorities on the government’s budget. Compare that with Republicans’ priorities. The DFL apparently hates trickle-down economics but they’re fine with trickle-down government. Thankfully, Rep. Daniels isn’t buying into the DFL’s economic theories. This is the time of year when hope springs eternal for legislative hopefuls. Think of it like the spring training for state politics. One pretender that’s feeling particularly enthusiastic is Ann Buckvold. She’s the DFL-endorsed candidate for House District 13B. This morning, Ms. Buckvold sent me a flurry or tweets explaining why she should be taken seriously. In 2014, the DFL candidate won 3 of the 25 precincts in the district. Jeff Howe, the GOP incumbent, won with 60.6% of the vote. If you eliminate Rockville, the reddest precinct in HD-13B, from the vote totals, Rep. Howe would still have won with 59.5% of the vote. FYI- How won Rockville with 722 votes compared with 255 votes for the DFL’s sacrificial lamb, meaning that Rep. Howe won that district with 74% of the vote. 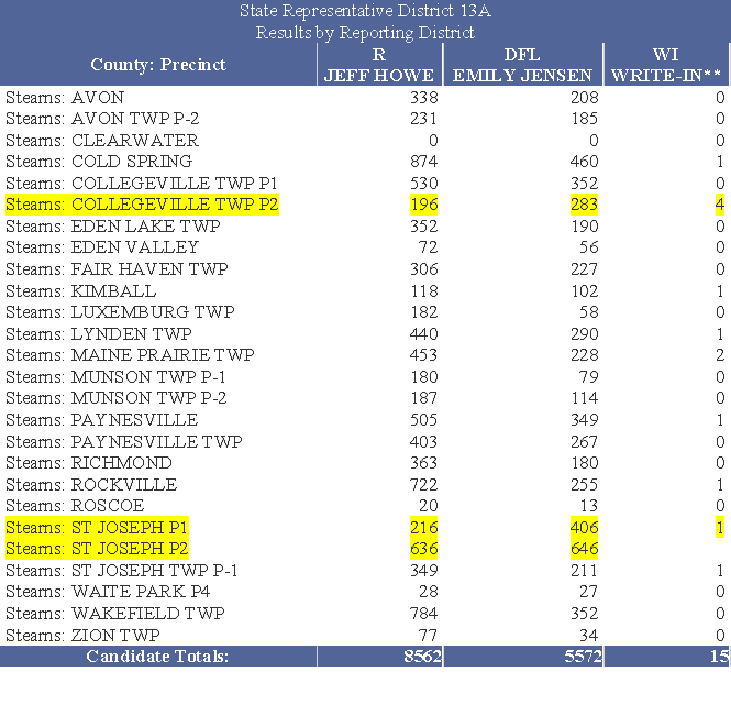 You know it’s a safe district when you can eliminate the reddest precinct and still win with 59.5% of the vote. My analysis isn’t mean-spirited. It’s just based on verified facts. I don’t think Gov. Dayton realizes that his veto of the Tax Bill is killing the DFL. When the editorialist writes “Gone was tax relief for veterans, gone was tax relief for small business owners, gone was a tax break for farmers, gone was a tax break for the residents of Houston County who live in Minnesota but work in Wisconsin, gone was the forgiveness of interest paid on debt on the new school building.” he listed all of the groups of people who were hurt by Gov. Dayton’s veto. That’s a devastating paragraph. Contrary to popular opinion, Republicans aren’t the ones at risk. The DFL is. While Gov. Dayton and the DFL whines about the end-of-session process, Republicans talk about the tax cuts that Gov. Dayton vetoed. In a messaging fight of end-of-session process vs. DFL vetoed tax relief, tax relief wins by a wide margin. If the DFL thinks that’s a fair fight, I’ll agree. It’s as fair a fight as I’d like. Davids, when receiving the phone call from the governor of his plan to veto it, worked to appeal to their friendship. The governor chose politics. The Republicans came up from $600 million to $950 million in the bonding bill that would’ve addressed transportation needs in the state. Davids said anything over $1 billion jeopardizes the state’s bond rating. The governor wants $1.5 billion with about $600 million going towards a new light rail line in the metro. Gov. Dayton is foolish if he thinks Republicans will cave on SWLRT funding. Like I said earlier, Republicans are in the stronger position. The DFL is sitting in a position of weakness, especially in outstate Minnesota. People living in outstate Minnesota won’t care if SWLRT is funded. They’ll care that Gov. Dayton vetoed their tax relief. The longer this drags out, the better it is for Republicans. That’s because they’re fighting for fixing roads and bridges and significant tax relief. That’s a winner for the GOP and then some. If the MNGOP wins these three races, it’ll be a big night for Minnesota Republicans. It’s still too early to predict victories in these races but I’d rather be the Republican in each of these races than be the Democrat. Franken clings to a six-point lead over his closest Republican challenger Mike McFadden, 48 percent to 42 percent. The poll has a margin of sampling error of +/- 3.1 percent. “This poll is a cannon burst into the Minnesota U.S. Senate race,” says political science professor Larry Jacobs of the University of Minnesota Humphrey Institute. Franken has a larger lead over another potential challenger, state Representative Jim Abeler. 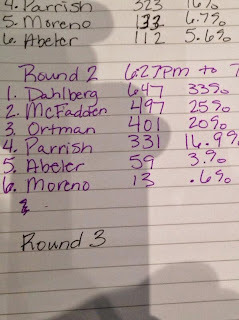 Franken leads Abeler by nine points, 48 percent to 39 percent. “The fact that even Jim Abeler is only nine points behind Al Franken indicates there appears to be a solid base of opposition to Al Franken,” says Jacobs. Let’s put this more succinctly. It isn’t just that there’s a “solid base of opposition to Al Franken.” It’s that lots of people haven’t seen Franken make a difference in Washington, DC. It’s like they know he’s there but the average Minnesotan, not the political activists, couldn’t make a list of Franken’s accomplishments. The GOP-endorsed candidate for governor, Jeff Johnson, trails Dayton 46% to 40%. 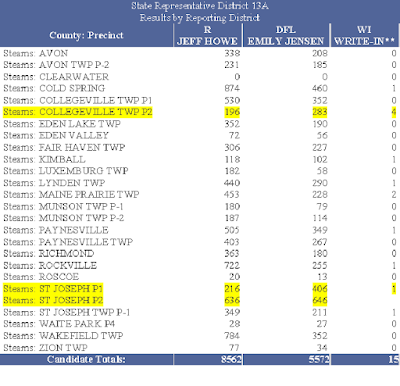 Dayton leads former House Speaker Kurt Zellers by seven points, 46 percent to 39 percent. Former House Minority Leader Marty Seifert is eight points back (46 percent-38 percent) and businessman Scott Honour is ten points back (47 percent-37 percent). This time, Dayton doesn’t have a third party candidate to put him over the top. This time, Gov. Dayton can’t take the Iron Range for granted, especially after he picked Tina Smith of Minneapolis to be his Lt. Gov. running mate. 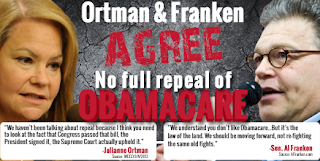 This time, the DFL’s smear campaign will be responded to. At this point, it’s difficult to tell the impact of the DFL’s tepid support for PolyMet will have on the election because that will affect both turnout and voting habits. If the DFL doesn’t get a huge turnout on the Range, Gov.-Elect Johnson and Senator-Elect McFadden are a distinct possibility. Gov. Dayton and Sen. Franken are in the fight for their political lives. Whether they survive depends partly on the quality of their campaigns and partly on the amount of outside money spent. In 2010, ABM spent tons of money smearing Tom Emmer. This time, they’ll have to decide which races to spend money on. It’ll be difficult for them to help Gov. Dayton and Sen. Franken while trying to hold onto the majority in the Minnesota House of Representatives. 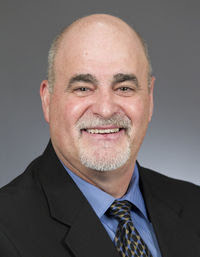 Minnesota Democrats have decided against debating a proposal to support the state’s non-ferrous mining development in Minnesota’s Iron Range as part of the state party political platform. “The mining issue has the potential to rip up the last remaining hard-core Democrats,” Democratic-Farmer Labor Party activist Joel Holstad told the Minneapolis Star Tribune. There’s another nagging problem that could grow into a major headache for the DFL: how to handle mining. If the environmentalists keep pushing for more and more environmental impact statements, they could push the Iron Range — long a party stronghold, into the laps of the GOP … or at least push longtime DFLers into apathy. Throughout the day Saturday, there were meetings among Rangers and party officials over how to handle mining. Even a milquetoast resolution party members had designed to try to please everybody was found to be offensive by the Rangers. (The resolution essentially said the DFL supports mining that doesn’t contaminate the water, etc.) “If they’re going to do a resolution like this on mining, why not on 3M, why not on every industry in the state?” asked Sen. Dave Tomassoni, who is from Chisholm and was a convention delegate. They were one in a message that had been honed specifically for a post-convention fly around stop on the Iron Range by Republican candidates and party officials. That verbal missive: The Minnesota GOP and its candidates are 100 percent behind mining, especially proposed copper/nickel/precious metals projects, and with a commitment to do more than just talk a good game on the issue. “The modern DFL in Minnesota has declared war on mining,” said Stewart Mills, 8th District GOP candidate to face U.S. Rep. Rick Nolan. Both Mills and Nolan are from the Brainerd area. “They (Democrats) need to do more than talk the talk … they need to start walking the walk” on copper/nickel mining, said House Minority Leader Kurt Daudt of Zimmerman, which is about 40 miles north-northwest of Minneapolis. If the DFL won’t truly represent the miners, these candidats will. He actually did things to push the process, compared with Al Franken and Amy Klobuchar saying that they’ve talked with the Forest Service. Cravaack held monthly meetings to push the issue with the MPCA and the federal government. Franken and Klobuchar have chatted with the Forest Service. The difference in commitment is startling. DFL Chairman Ken Martin can yap all he wants about the DFL’s commitment to the Range but actions speak louder than words. Thus far, the DFL is all words. Thus far, starting with Chip Cravaack, the GOP has been all action. How long will Ortman last? 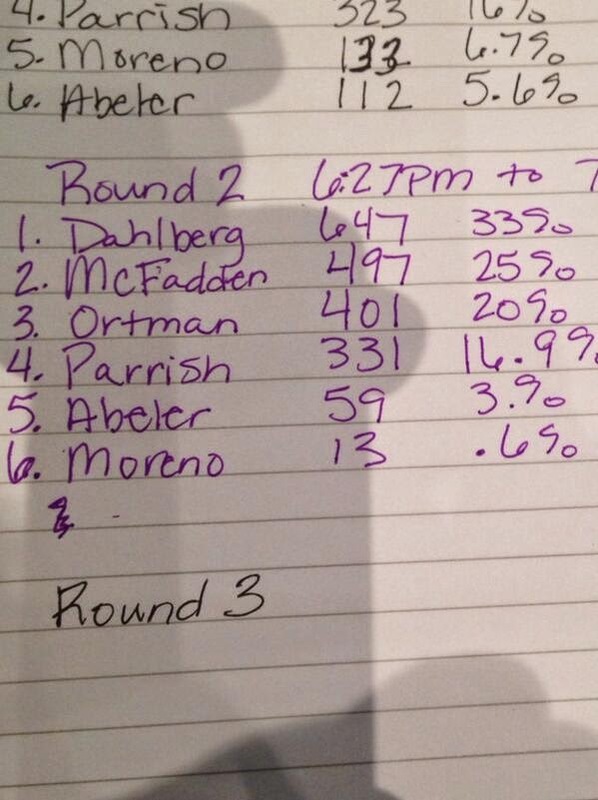 Sen. Ortman’s support dropped by 2 points from the first ballot to the second. Did this flier have that much of an effect? This certainly isn’t what Team Ortman was expecting. It’s one thing to be trailing after the first ballot. It’s another to trail 2 candidates after the first ballot. It’s quite another to be trailing those candidates after the second ballot. It’s the ultimate slap in the face to be trailing those candidates after the second ballot and losing ground. This isn’t the script Team Ortman had written. To steal a Yogi Berra saying “It’s still early but it’s getting later than you think.” I’d just ad that it’s getting later faster than Team Ortman would like.